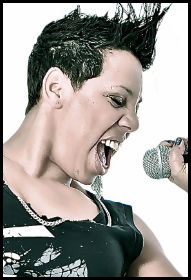 Natasha Watts, Singer, song writer, performer and all round entertainer. Where did she come from, humble beginnings a dream, a desire an ambition to be someone! Natasha started to sing at a very early age, performing arts from a young age was her passion, she trained in Ballet Tap Jazz dance and street as singing was not her dream until around the tender age of 14 and she discovered she had a voice, a powerful voice for someone so young. All her life Natasha was surrounded by music, all kinds of music Reggae Jazz Blues Funk Soul you name it, her father was a DJ and she had an older sister that raved so hard it was hard for Natasha not to know the words to every 80′s soul and raregroove track above her years. At the age of sixteen Natasha teamed up with Roame Lowrey percussionist with Maze and Frankie Beverly. He took Natasha to the states to experience recording and develop her as a young artist. Whilst in the states Natasha worked in on a stage musical and performed with Kirk Franklin and the Family, in these fruitful times Natasha’s talent grew and the inspiration from her current peers coaxed her in new directions and Natasha realised she had a new found love for Gospel and true RnB. Natasha’s stay in the states ended with the arrival of her son Taylor, this arrival took Natasha out of music for some years. But this is not the end of her musical journey. So we fast forward to the year 2006 Natasha joins Funkshone as the lead singer for the funk band, they have just one album together before they part company and Natasha goes it alone. Natasha credits her mother as her inspiration, in 2008 she loses the one woman who is her everything, and out of that awful time in her life comes “Time to shine”, still her favorite track to this day because of the deeply personal meaning behind the track! The last few years has seen Natasha once again in demand for her vocal talents from many well respected producers, and has collaborated with other various contemporary song writers and bands from Papa Records Reel People, Bugz in the Attic’s Kaidi Tathum, Speedometer on Freestyle records various tracks on Purple, Nervous, Barcoda and more recently as the main vocalist on a forth coming Yam Who? E.P. on the cutting edge label ISM records. All her life Natasha was surrounded by music, all kinds of music Reggae Jazz Blues Funk Soul you name it, her father was a DJ and an she had an older sister that raved so hard it was hard for Natasha not to know the words to every 80′s soul and raregroove track above her years. At the age of sixteen Natasha teamed up with Roame Lowrey percussionist with Maze and Frankie Beverly. He took Natasha to the states to experience recording and develop her as a young artist. Whilst in the states Natasha worked in on a stage musical and performed with Kirk Franklin and the Family, in these fruitful times Natasha’s talent grew and the inspiration from her current peers coaxed her in new directions and Natasha realised she had a new found love for Gospel and true RnB. Natasha’s stay in the states ended with the arrival of her son Taylor, this arrival took Natasha out of music for some years. But this is not the end of her musical journey. So we fast forward to the year 2006 Natasha joins Funkshone as the lead singer for the funk band, they have just one album together before they part company and Natasha goes it alone. Natasha credits her mother as her inspiration, in 2008 she loses the one woman who is her everything, and out of that awful time in her life comes “Time to shine”, still her favorite track to this day because of the deeply personal meaning behind the track! The last few years has seen Natasha once again in demand for her vocal talents from many well respected producers, and has collaborated with other various contemporary song writers and bands from Papa Records Reel People, Bugz in the Attic’s Kaidi Tathum, Speedometer on Freestyle records various tracks on Purple, Nervous, Barcoda and more recently as the main vocalist on a forth coming Yam Who? E.P.